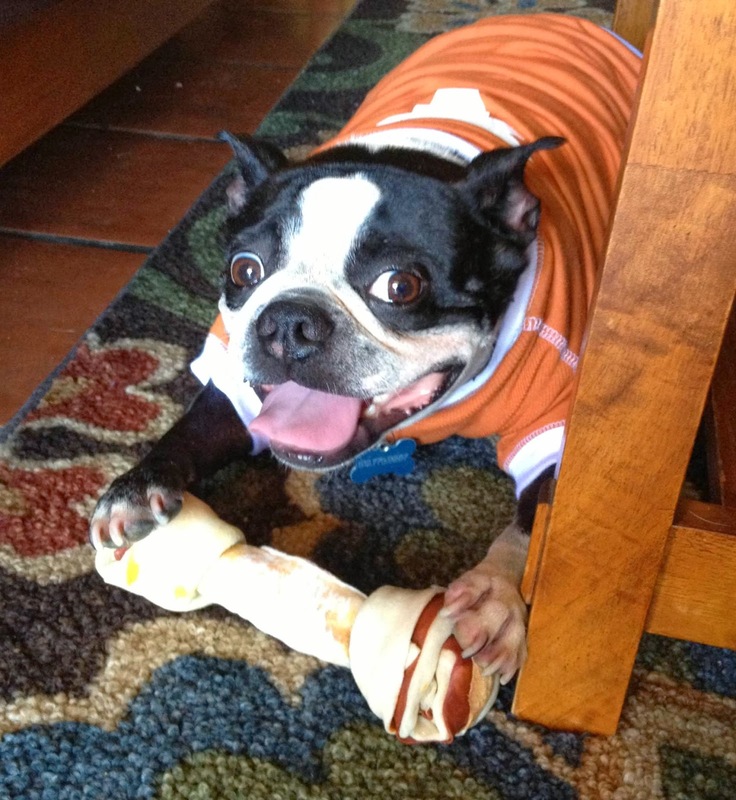 Amanda sent us this photo and says, "Gene is an awesome little Boston terrier. He's very low maintenance and friendly. Eveyone who meets him, loves him. Gene is a great surrogate dog for those missing their pets." I met Gene and saw him many times being walked on the docks at the St Thomas show in November. He is a very nice, loveable, and well-behaved puppydog. 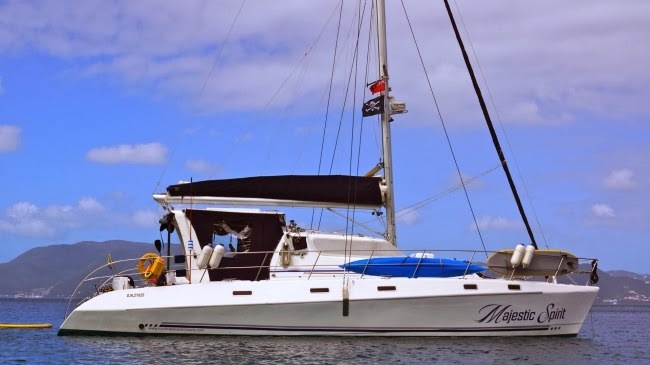 Twilight Rodeo is a 50-foot Voyage catamaran with a crew of two, Jim & Amanda. Twilight Rodeo is fully air conditioned and, while best for a group of 6, they can accommodate up to 8 guests in 4 Queen cabins. 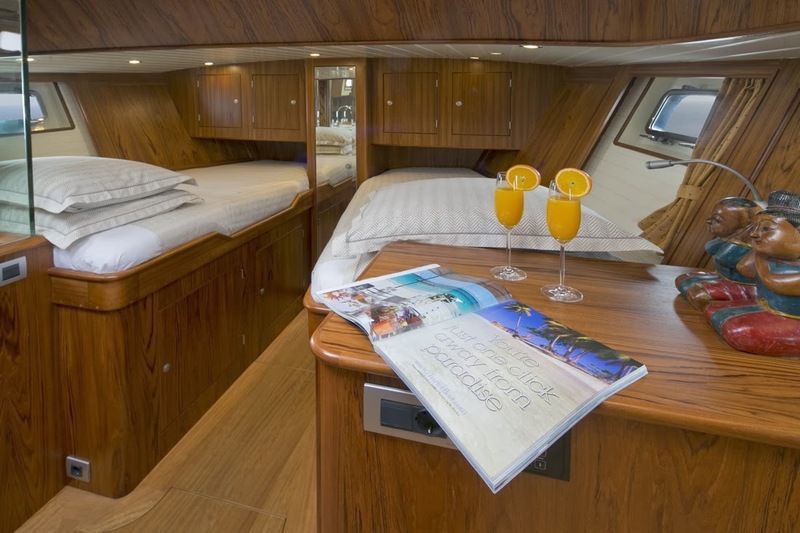 Three equivalent guest cabins have ensuite head/shower, while the 4th cabin located forward between the hulls shares a head and is only accessible from the deck outside (inquire). Twilight Rodeo has a 14-foot dinghy with 60HP motor, tube, wakeboard, 2-person kayak, 2 standup paddleboards (SUPs), snorkel equipment, fishing gear, hammock/deck swing, TV/DVD in salon, etc. And don't forget GENE!!! Come Sailing with Jim, Amanda, and Gene! 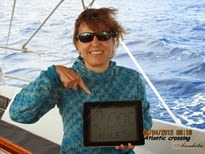 This weekend we reinstated our Rates & Yachts page for New England yacht charters. We have chosen a selection of yachts that we feel will be of best interest to our clients. This page has three sections: Monohull sailboats, Catamarans, Motor yachts. If you don't find what you're looking for on this list, please don't hesitate to ask. 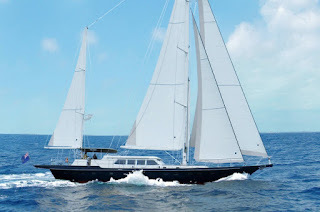 We have some very good "budget boats" such as the very popular Storm Petrel and Sea Witch, while the most expensive yacht we have listed is a motor yacht for $135,000/week (plus expenses). 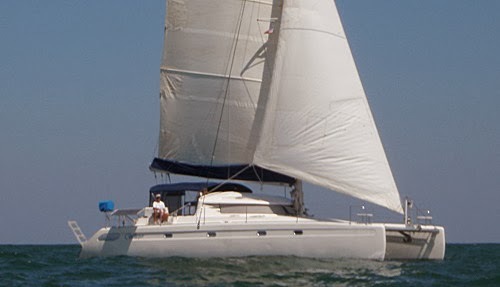 Many yachts are available for weekends, short charters, and day sails. Contact us for details. 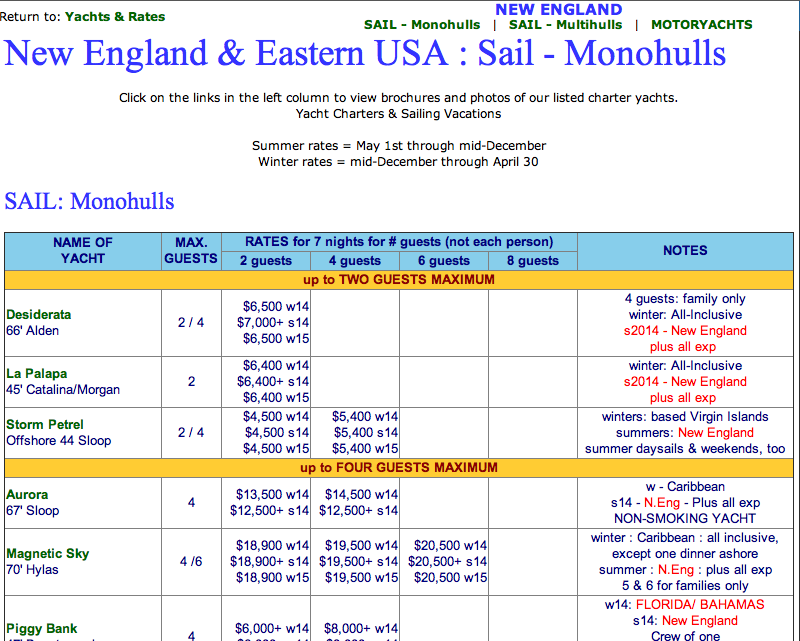 Availability is quite good at present for summer charters in New England. It seems like we always get slammed for last-minute charters so please book ASAP. We don't want you to be disappointed and miss out on a summer sailing vacation. 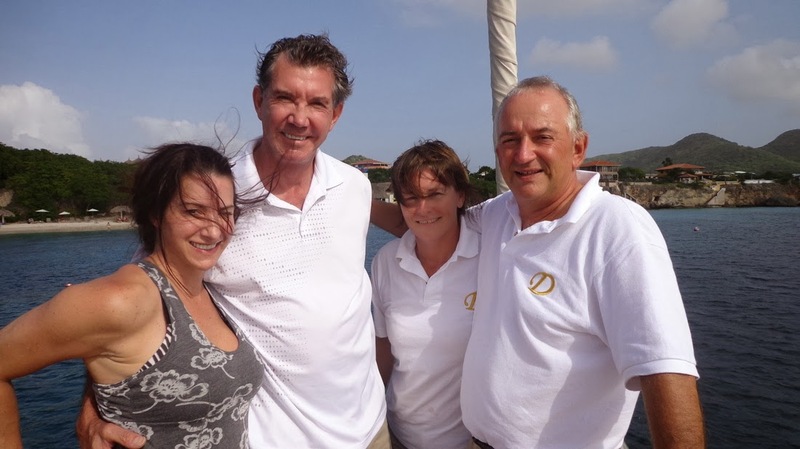 We would like to thank Hans & Christine of the charter yacht DOMICIL for the excellent time our clients had on their family's sailing vacation in January (2014). 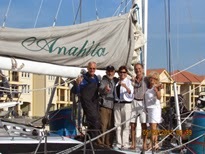 My family and I enjoyed a wonderful charter aboard the Domicil. 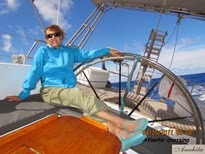 This is my 8th charter in the Caribbean and I must say it was the very best. We very much enjoyed the service of the crew, Hans and Christine. They truly pampered us and were so thoughtful with many little details. Christine’s cooking is absolutely superb. 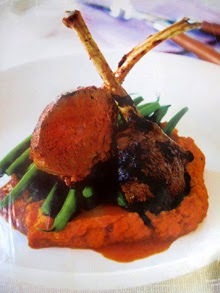 Every meal was beautifully presented a true feast. 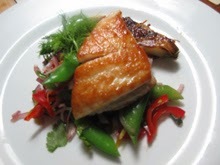 Just when we thought we had seen the best, she came up with yet another dish to top the last…thanks so much Christine! Hans is interesting and skillful as an Owner and Captain. He is so knowledgeable with a great sense of hospitality to make you feel at home. Both Hans and Christine take a personal interest in their guests, making them feel as if they are traveling among friends. Both make you feel as though you are on your own personal yacht and will do everything to ensure you have the time of your life. The Domicil is a wonderful yacht. The millwork (from Holland) and the interior finishes are spectacular and it sails very comfortably. With two master cabins there is so much space you feel you are on 100 footer. My other charters were in the northern Caribbean and these experiences have tended to blend into one another in my memory. 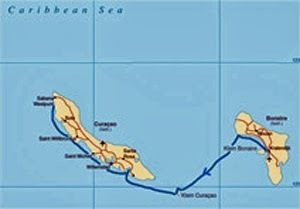 The Bonaire and Curacao Island are more distinct and interesting than what we have experienced before. We enjoyed our trips ashore to explore the local culture after receiving expert site seeing advice from Hans and Christine. Hans also invited us for a captain’s lunch on the beach where we were surprised with beautiful fresh lobster for lunch…thank you Gijs of Porto Mari! Hans’ local knowledge of the islands is formidable and whatever your request, he provides it with a phone call to one of the many connections on the island. We felt well cared for by all of the local companies we did excursions with. At the last minute, we wanted to rent a Jeep on Bonaire and drive around the island but all were already rented out for the day. Not to be detoured, Hans contacted his acquaintance who was the owner of the tour shop to rent us his own luxury SUV…thank you Mark Dieperink! In Curacao, we wanted to watch a NFL playoff game. Hans found a restaurant owned by an American couple who invited us over to watch the game. They were even kind enough to pick us up at the pier and drive us to and from the restaurant…thank you Mrs. Sunshine of the restaurant Solfood! We are looking forward to seeing you again soon. 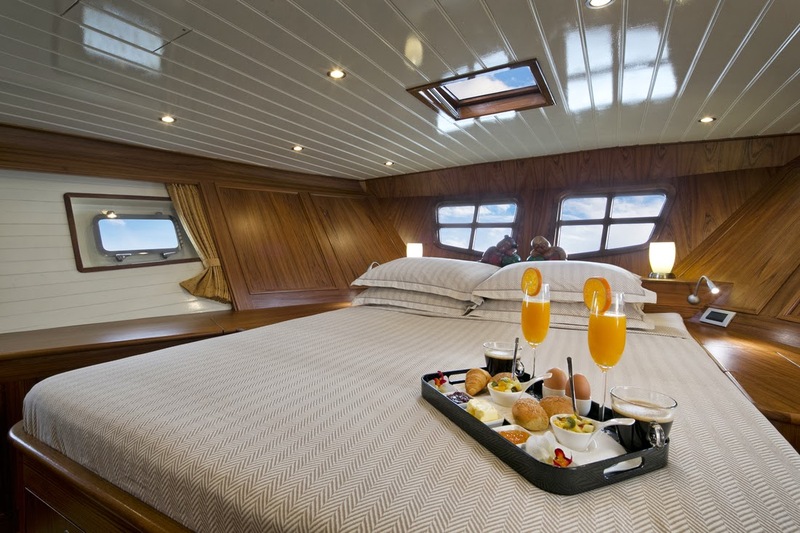 Domicil’s entire 85-foot length is dedicated to the pampering of just four guests. Domicil is air conditioned and accommodates up to 4 guests in 2 cabins. 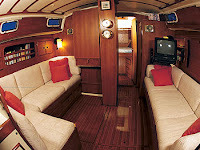 The master cabin is aft with a queen size bed, bathroom with marble vanity counter, stall shower and toilet. The forward guest cabin has 2 single beds (one twin, one 3/4), a sofa and ensuite bathroom with a stall shower and toilet. The contemporary interior furnishings and tranquil Asian art create a calming atmosphere. 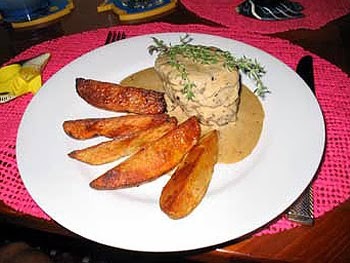 Her professional crew of two offers hospitality skills gained in luxury hotels on Curacao and Bonaire. Rates are all inclusive, except alcoholic beverages, 7% tax and possible port fees. Canoes, Scuba diving (party boat or private), Jetskis, Windsurfing, sailing dinghy - monohull or Hobie cat, private submarine, helicopter ride. Click HERE for Domicil's sample itinerary for a Bonaire-Curacao yacht charter sailing vacation. So, if you have chartered in the Virgin Islands and other areas of the Caribbean, this is an excellent opportunity to explore somewhere new... the ABC's. 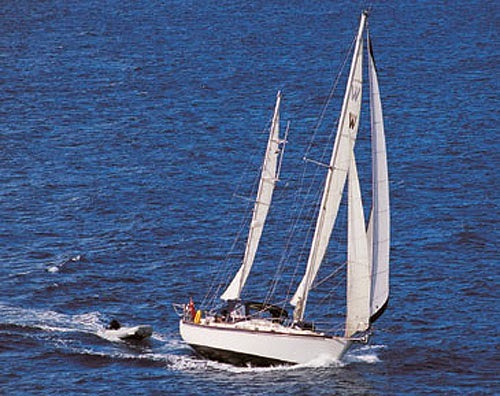 The charter yacht Corus, a Whitby 42 ketch, is one of our favorite charter yachts for two. We have a bit of news from Bill and Ann, including a special offer. 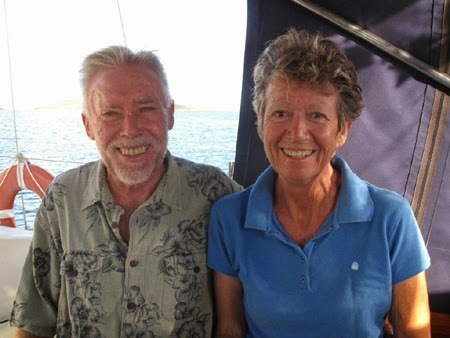 Bill and Ann brought their experience from careers in the hospitality industry to crewed chartering, and it shows. They love and respect the BVIs; promoting and protecting its bounty and beauty. They are keen to share their knowledge of the Territory with their guests. Both are active in sports... playing tennis, cycling, hiking, as well as engaging with guests in the tropical pleasures of swimming, snorkeling and scuba diving. 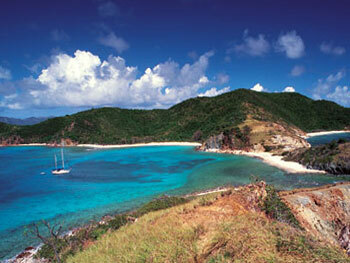 Bill’s knowledge of the BVI dive sites for both the newbie and the expert diver is unrivalled. Bill and Ann both have many interests. They are very well read, have travelled extensively and continue to love meeting new people; hosting them and entertaining them. 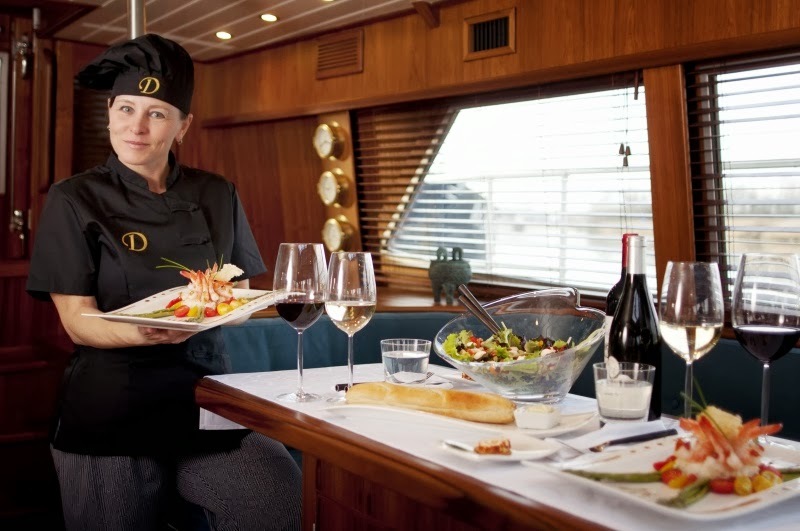 Ann’s outstanding culinary skills are well known throughout the charter fleet. She continues her foodie quest, so no meal preference or dietary need is a barrier to a gourmet dining experience on Corus. 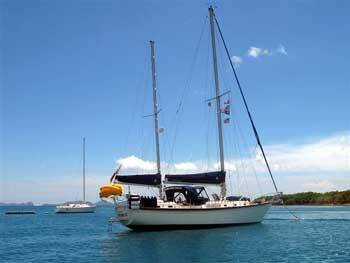 Corus is a Whitby 42 ketch, owned and crewed by the British couple, Bill and Ann Hasted. Corus has a large guest cabin aft with a queen-sized berth, ensuite head/shower and a separate entrance via the center cockpit. Corus has a 14-foot dinghy with 25HP 4-stroke motor, 2 one-person kayaks, snorkel equipment, hammock, DVD on laptop, beach toys, underwater camera & video, Celeston GPS Sky Scout, onboard internet to occasionally check email from ship's computer, or bring your laptop and use local hotspots where available, etc. Bill is a Dive Master and includes 4 dives/week for certified divers. Divers may bring their own gear or rent. We had a terrific week with Ann and Bill. It was really relaxing and truly enjoyable. Both of them are very interesting and did everything to make our stay a fantastic experience. 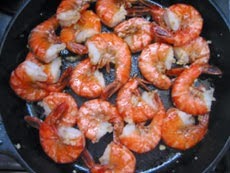 The boat lends itself very well for a cruise and the diving and food are great additions to the sailing. Thank you for guiding us in our choice and your patience in finalizing the vacations. We look forward to another experience. Looking forward to your inquiries! 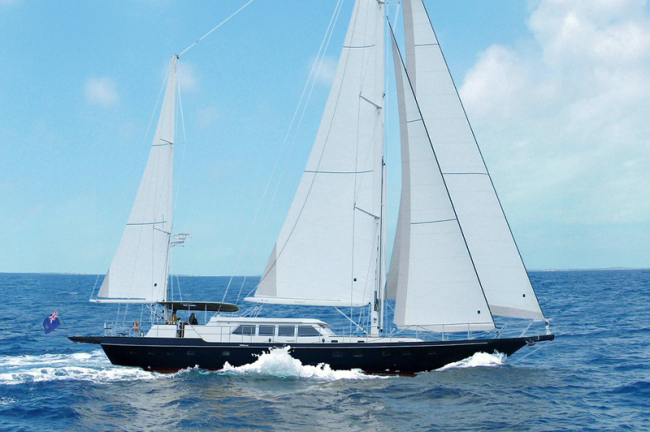 The charter yacht Frangines, a 55-foot Argo catamaran, has a special offer which runs through mid-August 2014. $1000 off standard, 7-night charter rate. This means that a 6-person charter is only $12,000/wk. Valid for new bookings taking place between now and August 15, 2014. 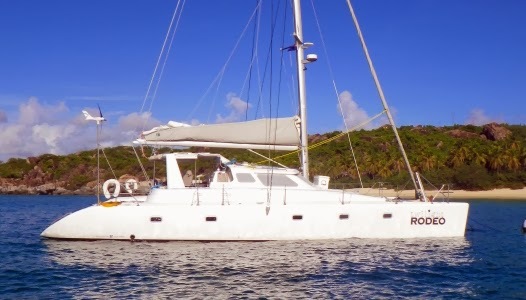 Frangines is a 55-foot Argo catamaran with a crew of two. Frangines is air conditioned and accommodates up to 6 guests in three cabins with queen berths, each with DVD players and ensuite heads/showers. They have a 14-foot dinghy with 60HP motor, waterskis, kneeboard, wakeboard, tube, kayak, 2 standup paddleboards (SUPs), snorkel gear, fishing equipment, underwater camera, floating mats, 32" flatscreen TV with DVD in the salon, wifi where available, laptop computer for guests to use, etc. 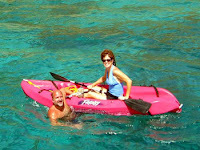 Captain Rick is a dive master and 5 dives/week are included for certified divers. Bring own gear or rent. Cliff and Brooke. What an amazing pair! This trip exceeded our expectations, food, fun, dancing, sun and wonderful memories. We look forward to sailing with you again. Cliff/Brooke, Thank you for everything! Words cannot describe how unbelievable this trip was. We are never staying in a resort/hotel again! Food, drinks, snorkeling, Cliff and Brooke were fantastic!! Best vacation of all time in the history of EVER!!! My favorite place was Monkey Point in Guana Island. My favorite meal was...ALL OF THEM! Some of the best food I've ever had in my life. Brooke and Cliff are an unstoppable duo of extreme awesomeness. We were blessed, truly, for having them lead the way. I will never ever forget the memories that the two of them have so graciously aided in creating for our family. The charter yacht Majestic Spirit is a 53-foot Royal Cape catamaran with an owner-operator crew of two, Dave and Desirée Bean. Majestic Spirit is fully air conditioned and accommodates up to 8 guests in 4 cabins (3 Queens, 1 Double) each with ensuite head/shower. 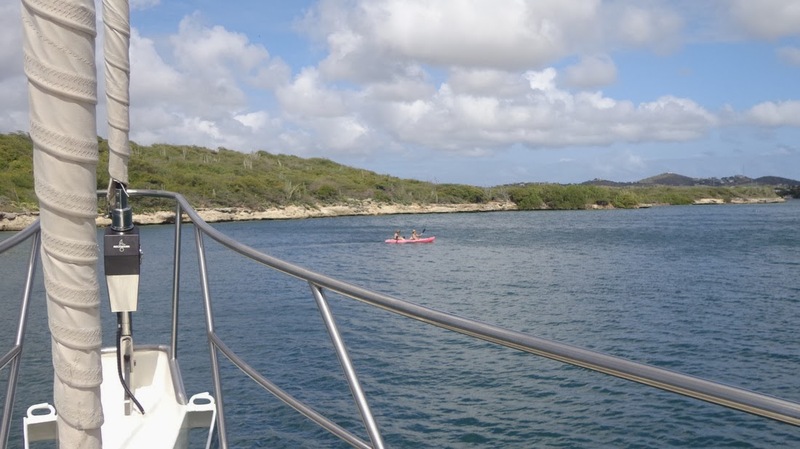 They have a 15-foot dinghy with 50HP motor, waterskis, tube, kneeboard, wakeboard, 2 one-person kayaks, 2 standup paddleboards (SUPs), snorkel gear, fishing equipment, floating sun cushions, underwater camera and video, hammock, TV/DVD in salon, onboard wifi where available, beach games, etc. Majestic Spirit is a fully registered SSI Dive Center/ Dive Boat with two experienced and passionate divers (Instructor & Divemaster). 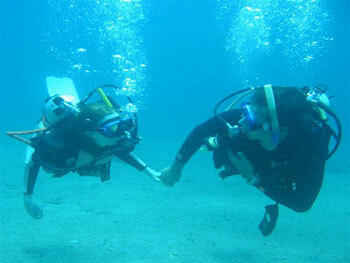 Diving is included in their charter rate: Certified divers: 5 dives/week, gear included. Non-certified divers: 1 resort/discover scuba course. Just bring your wedding dress, we'll look after the rest! A romantic dinner ashore ($300 allowance) plus a complimentary bottle of champagne for the bride and groom on wedding night. Other guests on the charter (if any) will dine aboard Majestic Spirit allowing the bride and groom their special romantic dinner ashore. Following your wedding, you will receive, an official certified copy of your marriage certificate. 7-night minimum and no other specials may be combined with this offer. Inquire for special pricing for additional couples renewing vows or being wed in the same charter. Offer valid until further notice. The charter yacht Whisper 42, a 42-foot Fontaine Pajot catamaran that has recently joined our fleet, is offering introductory rates. Save over $2400 on a weeks' charter. 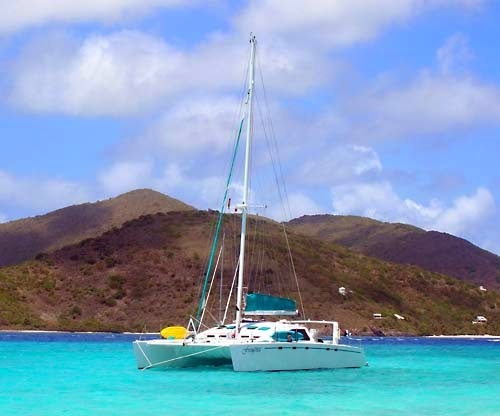 Whisper is a 42-foot Fontaine Pajot catamaran with a crew of two. Whisper is fully air conditioned and accommodates up to 4 guests in 2 Queen cabins with a shared head/shower located between the two cabins. Whisper has an 11-foot dinghy with 15HP motor, 2-person kayak, noodles, snorkel gear, fishing equipment, TV/DVD in salon, etc. 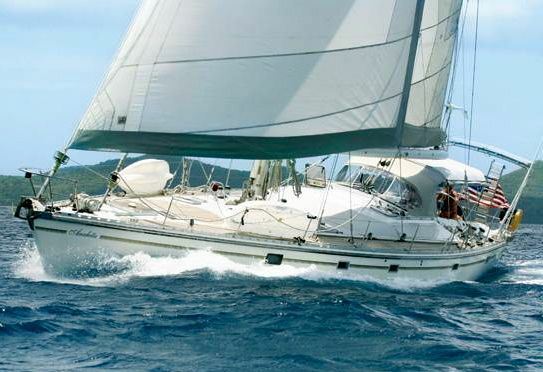 For charters booked by April 30 2014, we offer a free sleep aboard the night of your arrival before the charter. This boat is ideal for a couple or a family with one or two children. The charter yacht ANAHITA, a 62-foot Dynamique sloop, has an opening for two paying crew on their 6th eastbound trans-Atlantic crossing. 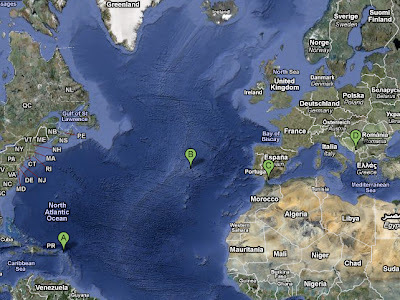 This is an excellent opportunity to get some sea miles and a unique adventure. Join Captain Bijan and Chef Roseanne in St. Thomas, USVI for the May 1st departure. Cost: $6500/person, all inclusive except bar. Note: While in port in the Azores, only continental breakfast will be served and no other food is included in the charter fee. Continue to the Balearics, Sardinia or Naples, additional per day rate. We just finished our wonderful Atlantic crossing. We couldn’t have found a better boat or a better captain and chef for this most wonderful experience in our lives. Bijan is “The Best of the Best." An unforgettable adventure! 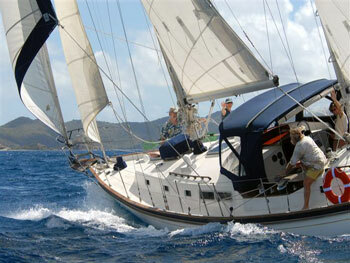 What a wonderful opportunity of an adventure charter this will be for two lucky people. We (Bob & Sheila) love passages. It is so cool to look out and just see water all the way out to the horizon... Of course, you'll see the occasional ship and flotsam can get quite exciting. Maybe you will even catch a nice fish for dinner on your way!